Sun Life’s new building in Oracle. 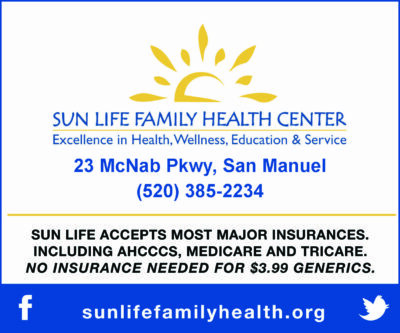 Oracle, AZ – Sun Life Family Health Center is hosting an Open House and Health Fair on Saturday January 19th from 10am – 1pm at 1040 W. American Avenue (formerly the Family Dollar), their NEW office location which opened its doors on December 3rd. Sun Life Family Health Center would like to invite the community to attend the FREE event. Sun Life will be providing FREE Blood Pressure Screenings and opportunities to tour the new building. Sun Life has partnered with the University of Arizona Cooperative Extension to provide children’s hearing screenings. 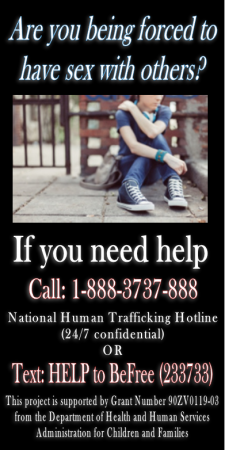 There will also be various organizations providing giveaways and information on community resources. Sun Life Family Health Center is Pinal County’s largest primary care provider, and was one of the first community health centers in the state to have received accreditation from the Joint Commission (the gold standard of quality in healthcare). 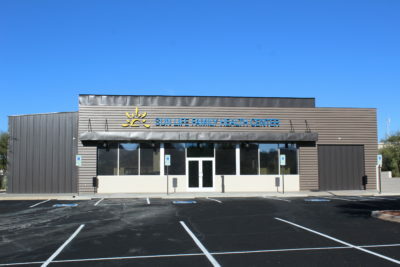 Sun Life serves both insured and uninsured patients, and provides health services in family practice, dentistry, women’s health, pediatrics, integrated behavioral health, diabetes education, and much more. Sun Life operates several family practice offices, located in Apache Junction, Casa Grande, Coolidge, Eloy, Florence, Maricopa, Oracle, and San Manuel. Women’s wellness and maternity services are available at our Centers for Women in Apache Junction, Casa Grande, Chandler and Maricopa. Both Family and Pediatric Dentistry are available in Casa Grande. Our Apache Junction, Casa Grande, Eloy, Florence, Maricopa, and San Manuel locations offer a public pharmacy. Sun Life offers Pediatrics in Casa Grande and Maricopa. To learn more about office locations and hours, visit www.sunlifefamilyhealth.org. Sun Life… Excellence in health, wellness and education.